Our campaign is highlighted by our friends at Food First on Huffington Post in this great article co-written by our ISU student allies, Ahna Kruzic, Angie Carter and Rivka Fidel. Please comment at Huff Post and please share widely! Another skirmish in the global battle over GMOs has broken out — this time at Iowa State University. Recently, a coalition of students delivered a petition with 57,309 signatures to ISU’s College of Agriculture and Life Sciences protesting an upcoming human feeding trial of genetically engineered (GE) bananas. The petition, addressed to the college and The Bill and Melinda Gates Foundation, was simultaneously delivered to by AGRA Watch to the Gates Foundation headquarters in Seattle. If the experiment takes place, twelve female ISU students will be paid $900 each to eat the bananas in what is billed as one of the first human feeding trials of GE products. But this study doesn’t really address public health or environmental risks, it’s about testing to see if the GE banana, high in beta-carotene, actually delivers more Vitamin A to the consumer. 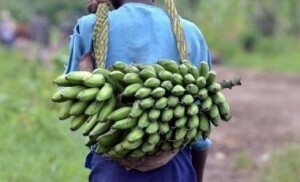 Like Golden Rice and other bio-fortified products, the claim is that the GE banana has the potential to save lives — ostensibly in Vitamin A-deficient Uganda in East Africa. The opportunity to engage in a scientific dialogue is indeed a privilege — one usually reserve for those with power — and rarely extended to university students, the general public or the populations who are the objects of scientific research. With this privilege comes the responsibility to ask difficult questions about the ethical dimensions of GE banana research, as well as its potential impacts and the possibility of other viable alternatives. If it takes a student petition with 57,309 to open up public debate on the issue, the students should be thanked, not ridiculed. The students’ questions recognize that hunger and malnutrition are not just biological or technical challenges, they are social problems rooted in poverty, inequality and a skewed distribution of resources. Ending hunger can’t be reduced to simple gene transfers, and the socioeconomic and agroecological impacts of GE go far beyond the single crops in which they are genetically expressed. For an approach to hunger and malnutrition to be scientific, it must incorporate — and take part in a dialogue about — the social, economic, political and environmental consequences associated with the proposed technology — GE or non-GE. No scientific study is free from the social, political, and cultural context in which it is conducted. We all benefit from meaningful critiques, pulling from multiple scientific disciplines that challenge the technology and its potential uses, as well as interrogate who controls, owns, and profits from it. While administrators at public universities, philanthropic organizations, and private corporations talk about “saving lives,” many others want to rebuild their lives on their own terms, through agroecological methods and food sovereignty. As the IAASTD—the 4-year study by over 400 scientists concluded in 2009—suggests, rather than putting so many eggs into the GE basket, we should be investing in agroecology and local food systems development. Posted in Agra Watch Blog Posts, Agra Watch News, Events, News.